Autowood Restoration specializes in creating Chevrolet wood kits and the installation of wood for all types of vintage cars. Our biggest selling Chevy wood kits are from ’29 to ’32, but we are not limited to just those years. You can buy individual wood parts or an entire wood kit at a substantial savings. 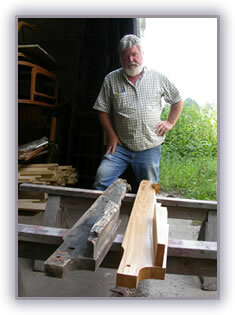 If you send in old wood from a Hudson truck or a Cadillac, we can copy it in new white ash down to the smallest detail. Overall, Autowood Restoration offers extremely attractive pricing on the highest quality auto wood components. We can because we've been doing it longer than anyone else. Autowood Restoration offers phone support and installation assistance. There are exploded-view diagrams available for many popular kits. We also function as a ready source of related information, directing customers to quality craftsmen involved in all aspects of antique automobile restoration. Call Jim Rodman at 219-797-3775 to learn more.